Are you a mum looking to return to work and want to have fun, use your brain and meet new people? 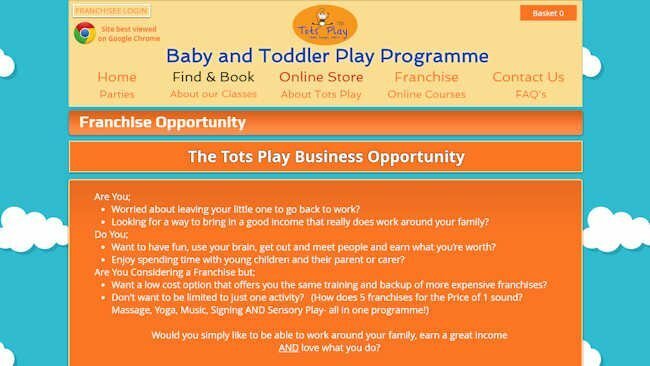 If you’re looking to run a business that will provide you with an excellent income and enable you to work around your family, then Tots Play could be the ideal opportunity for you! Tots Play is a multi-activity, developmental play programme of movement and sensory-based play classes for babies and toddlers from birth to around 3 years to attend with a parent or carer. Tots Play offers a little bit of (almost!) everything. Instead of customers having to choose between music, yoga, movement, sensory or singing class for their little ones, they can give their children all of these experiences in one programme, and have lots of fun too! Tots Play is also one of the few programmes that offers classes for very young babies. This is invaluable for new mums ready to get out and meet people and wanting to make the most of their (often short) maternity leave from work, while doing something fun with their baby. They are then able to continue through the different stages of the programme as their baby grows, meaning parents often stay with Tots Play for many months or even years, and then bring their next child along. The Tots Play franchise programme uses a proven business model and systems to run a Tots Play business in your local area at times that suit you. As a franchisee, your role would include leading high quality, interactive, play sessions and parties for local families and making friends in your community. You’ll spread the word about the fantastic developmental benefits that the Tots Play programme provides, creating new sensory experiences to share with your customers and helping to build the Tots Play brand. No specific qualifications or experience are needed to run Tots Play classes, but you must enjoy working with young children and their parents and be able to make them feel welcome. You will also need plenty of energy and enthusiasm to get everyone involved, the confidence to lead a group in various play activities and a strong desire to grow and develop your own business. Full training and support will be given as you set up and grow your business. Tots Play is seeking new franchisees to bring these classes to families across the country. If you would like to work flexible hours around your family, love spending time with young children and their parents, and want to earn what you’re worth, then Tots Play would love to hear from you. Request Tots Play’s comprehensive franchise information pack from their website to find out more, and you could be well on the way to making the change that your life needs.